Police in Springettsbury Township, York County, say someone gained access to a PennDOT sign to write this warning about zombies. That's what motorists in one Pennsylvania town were warned Thursday afternoon. But authorities want to be clear: There is no imminent threat of a zombie apocalypse. Police in Springettsbury Township, York County, posted a photo of the PennDOT sign that greeted drivers on East Market Street. Someone apparently gained access to the sign and typed in the message, police said. 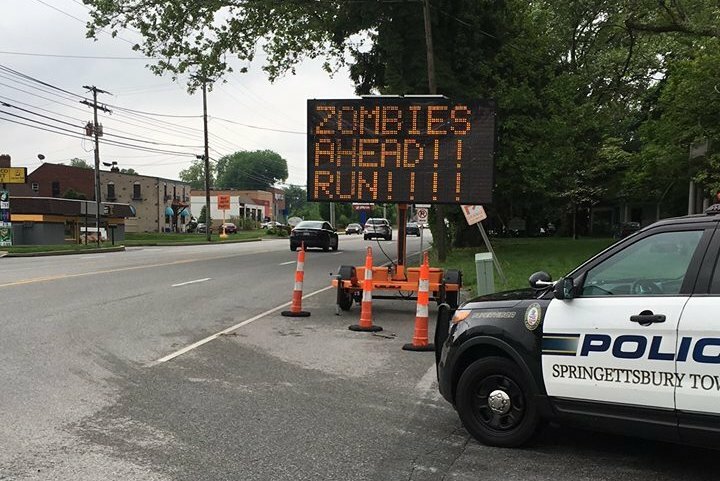 "We hope there was no public alarm today as there were no reports of Zombies anywhere in Springettsbury Township," police wrote. One Facebook user who commented on the post asked the question we all want answered: If there is an actual report of zombies, how will the public be alerted? "We use the color coded Zombie alert system," the police department wrote in response. "Right now we are green. If it ever gets to orange we will release further instructions." Currently, there is no information about said zombie alert system on PennDOT's website. I suggest you write to your local lawmaker to have this corrected. It could have been worse – hackers displayed a more vulgar message on road sign along I-95 in Delco earlier this week.